The chain said it would invest $US40-50 million in store upgrades and employee bonuses, and the spending seems to have spooked investors. 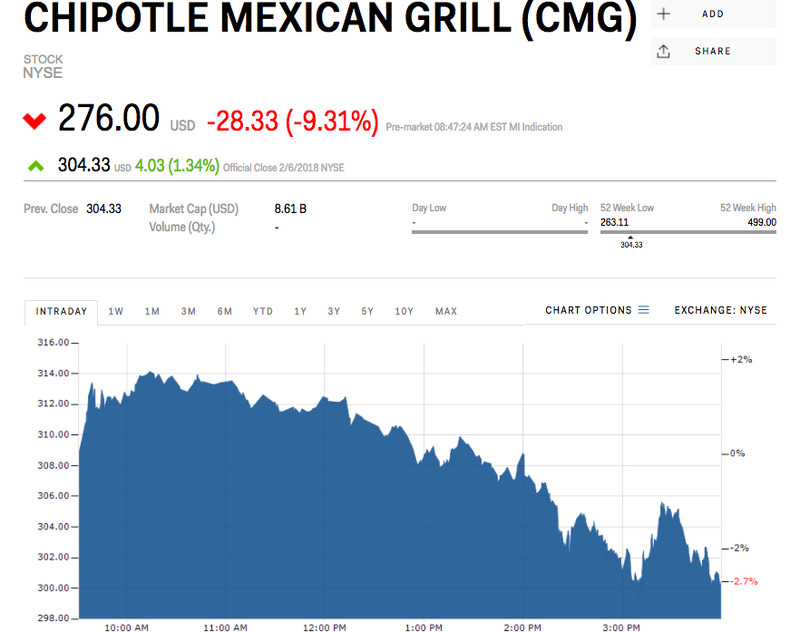 Shares of Chipotle Mexican Grill are set to open down more than 9% Wednesday morning, despite an earnings report that beat Wall Street’s expectations following Tuesday’s closing bell. Chipotle said it earned an adjusted $US1.34 per share on revenue of $US1.11 billion during its fourth quarter. Wall Street analysts polled by Bloomberg had expected $US1.32 per share on revenues of $US1.12 billion. 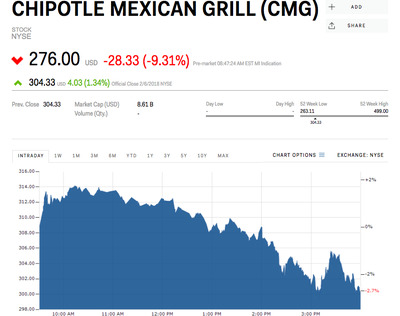 The stock initially spiked as much as 3% after-hours Wednesday, before slumping overnight as investors digested Chipotle’s announcement that it would invest approximately $US40 to $US50 million of tax savings this year on store upgrades, staff benefits, and employee bonuses. “During 2017, we have made considerable changes around leadership, operations, and long-term planning and it is clear that, while there is still work to be done, we are starting to see some success,” CEO Steve Ells, who recently announced he will depart the troubled chain when a replacement is found, said in a press release. Still, plenty of Wall Street analysts remain bullish on Chipotle’s comeback. “We are lowering our numbers as higher unit openings and slightly better comps are offset by somewhat higher investments and a significantly higher than expected tax rate for F18,” said Bernstein analyst Sara Senatore. Despite the 11% cut, her price target of $US500 is still higher than any other analyst polled by Bloomberg, and a full 80% above where shares are set to open Wednesday. Was Street has an average target of $US304 for the stock, roughly in line with Tuesday’s closing price.